The Dachshund belongs to LGean Richardson of North Austin, who adopted the critter along with 4-year-old Dino from the Austin Animal Center in April after her husband of 69 years, Thomas, died. 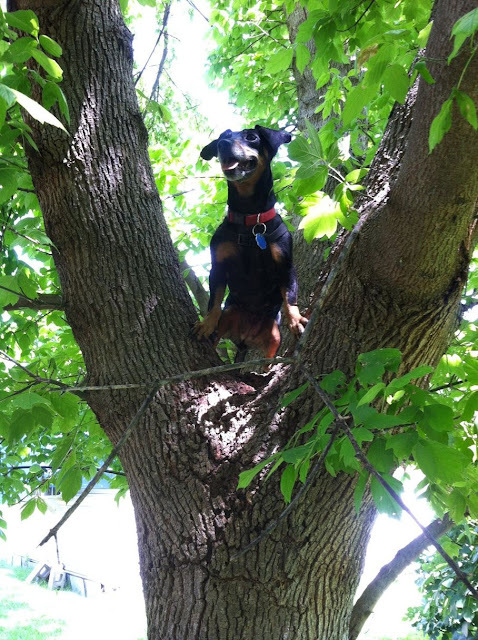 It took a while for Richardson to discover Bridget’s tree-climbing talent, but there were clues: The dog first escaped through a hole in her yard’s chain link fence. When an object was placed in front of the opening, Bridget scaled that, going up and over. The third time the tiny dog went missing, Richardson searched the house and yard, but her pet was nowhere to be found. So she grabbed her cane and headed down the street to look for her. When she arrived back home, the dog was lounging on the sofa. She had no idea where Bridget had been hiding until one day when friend Maria Ramirez, in the backyard during a visit, burst into the house calling for her. Richardson walked slowly into the yard, past the spreading fig bushes, to find her pet a good six feet up in a large tree. It turns out that Bridget chases squirrels and, Richardson says, now scampers and scrapes her way straight up the tree on her short legs almost every time she is let out into the yard. The first crook is around four feet off the ground, but Bridget doesn’t stop there. When she’s ready, Bridget climbs back down. It’s clear the woman and her dogs have bonded deeply since April. Richardson thinks Bridget’s tree-climbing is pretty special (she shared the tale with her veterinarian, who had never heard of a dog that scaled trees), but that’s not the only reason she wanted to share it. She visited three shelters before she found Bridget, adopting both her and her cage mate, Dino, because they looked deceptively calm and quiet together. She saw a lot of animals in those shelters and suggests that others might want to find their own pets to bring home. “You never know what their talent is until you get them,” she says, smiling. Read more and see another photo at the Statesman. Have a great holiday weekend. So many Doxies would be completely jealous of this talent! Yeah! Glad to hear she is from the city where I live. My little black and tan longhair did this once : There was a tree in the backyard with a sloping trunk like this /\ rather than straight like this II and the imbecile chased a squirrel right up the tree. I had to reach up and take her down , and my hands were shaking because I just knew the little cretin was getting ready to jump. Thankfully for my peace of mind, she only did that once.